Parents – Has your child been fingerprinted at school? In the interests of “efficiency” on school dinners and library lending has your child been fingerprinted at school? The ATL teaching union has raised this issue at their annual conference but the natural question arises – who would have permitted access to the pupils if not teachers and school principals? Having worked hand in hand with the DENI in their joint campaign to end academic selection the Ulster Teachers Union (UTU) have now turned on their masters when the issue of cuts to education budgets are imminent. Avril Hall-Callaghan, one of those educationalists most involved in the failed attempt to remove academic selection at 11 by testing spoke on BBC Radio Good Morning Ulster invoking her union’s concern for pupils and their parents. 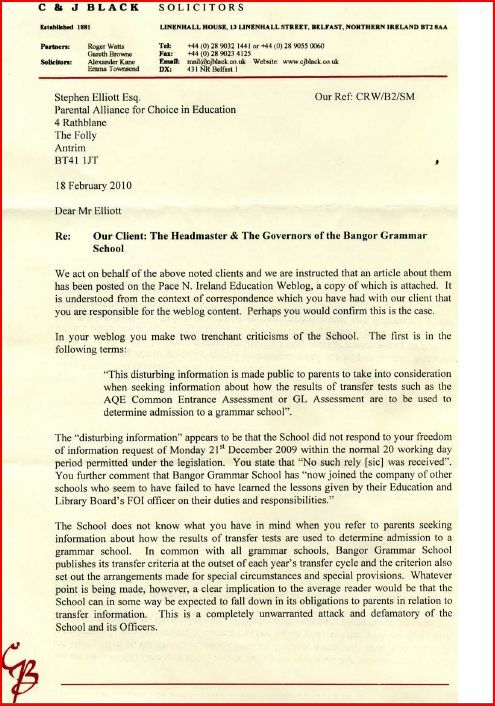 Of course she insisted that her members should not participate in any preparation for transfer tests to grammar schools. Perhaps parents should examine the belated concern of teachers about A-Level results in the context of curricular changes. Avril Hall-Callaghan has remained silent on this matter. Rising numbers of teachers are concerned about the quality of A-levels, a report suggests. One in four A-level teachers are worried about incorrect grading and marking of exam papers, according to a study by regulator Ofqual. The survey of 500 teachers, more than 400 parents and children and almost 1,800 members of the general public looked at perceptions of GCSEs and A-levels following the 2009 exam series. It highlights an increase in the proportion of teachers who believe the accuracy and quality of marking of papers has decreased in recent years. PACE published findings on Key Stage 3 results linked to teacher assessments demonstrating similar trends. Not a word from union leaders or teachers. School Place Snoopers U.K.- wide. The Secretary of State for Education, Ed Balls, has ordered education authorities to crack down on school applications searching for lies. He also set up a whistleblowing hotline to encourage parents to snitch on others they meet at the school gates. Those who are caught out could face community service and a criminal record. Applicants for grammar school places in Northern Ireland can expect similar action from Caitriona Ruane, Education Minister for Northern Ireland (not the north). The announcemnt by the Irish News of four Catholic grammar vschools becoming comprehensive was predicted by PACE. Perhaps those parents taking GL Assessment tests last year are rightly nervous this morning.